Our mission is to become “Your Destination Store” for quilting supplies, fabrics, classes, community and more. Not only on a retail brick and mortar level, but our new ONLINE STORE offers ANYTIME SHOPPING and convenience when searching top multiple brands, both traditional and modern products, fabrics, supplies, and a personalized customer experience. 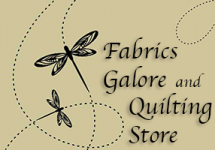 Please feel free to inquire with us at Fabrics Galore and Quilting Store by sending your comments and questions via our Guest Contact Form. If you’d like us to keep you “in the loop” with specials, events, classes and workshops, be sure to SUBSCRIBE to our eNews. You can unsubscribe anytime if you decide to opt out, but we hope our plans to engage you with the wonderful world we’re building, that you’ll decide to remain a loyal and very appreciated customer of Fabrics Galore and Quilting Store! We look forward to a fun and engaging year and we thank our Quilting Community for all of your support and engagement with Fabrics Galore and Quilting Store last year. There's a whole lot more to come! If you're not subscribed yet, please consider Subscribing to get news, specials and events in your email inbox AND a coupon to use when you shop in our Blairsville, GA retail store.